Andrew Muccitelli was born on December 1, 1998 and resides in Westlake Village, CA with his parents. Receiving letters of introduction is just one of the many ways that this site is led to young talented musicians and vocalists. It was my Facebook friend Anthony Berube that led me to a young man with a voice bigger than life itself, and a talent for showmanship that outshines most youngsters his age. 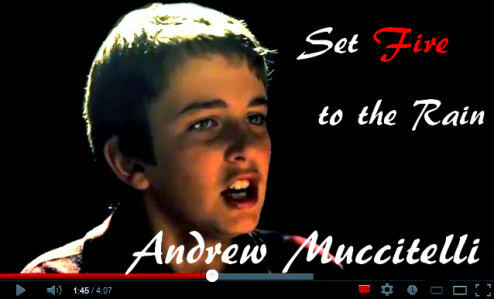 I’m talking about the amazing thirteen year old vocalist and musician Andrew Muccitelli. After receiving the tip from Anthony, I immediately went to Andrew’s YouTube Site to check out all of his videos. What I found was truly outstanding and I could not wait to share it with everyone so I posted Andrews’s video shown below on May 20th to Young Artists Global. I received a few comments all stating how talented Andrew was and it was from those comments that I learned that Andrew had been a participant on X-Factor Season Six. This only increased my determination to learn more about Andrew. Happily, I was able to get in touch with Andrews father, who shared the following about his extremely talented son. Andrew Muccitelli was born on December 1, 1998 and resides in Westlake Village, CA with his parents. One night, Andrew saw Cher’s Farewell Tour special on TV. He was mesmerized by the lights, Cher’s costumes, and the stage. That is when Andrew first started to love music. He would sing around the house, at friends’ houses, and even in the car. Until age eight, Andrew would just sing casually. 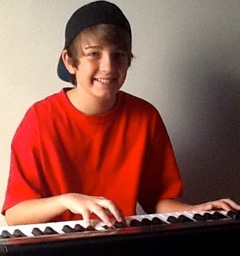 He joined a music school which allowed him to perform at local venues with other students from the school. At Andrew’s first performance, he did covers of songs by Queen. Despite being nervous, when Andrew walked on stage, he felt at home. For four years, he continued to perform around town with the music school. 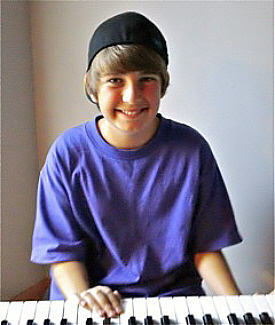 At age 10, Andrew decided he wanted to play piano after watching Lady GaGa play some of her songs acoustic. When Andrew was twelve, Andrew was offered to become the new lead singer of rock band SLATR. Even though the members of SLATR were only 11-13 years old, they were covering bands such as Rush and Led Zeppelin at their shows. They won Shredfest 2011, a battle of the bands, for their performance.